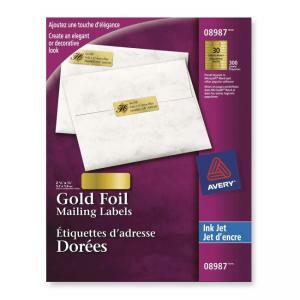 Create stylish gold or silver foil address labels. Perfect for special occasion mailings requiring a customized, sophisticated appearance. The foil has a glossy finish that provides for brilliant colour and sharp text quality, plus exceptional photo reproduction. Ideal for special messages, announcements, invitations, gift tags and any special occasion. Avery offers many easy-to-use templates for Microsoft Word and other popular software programmes.